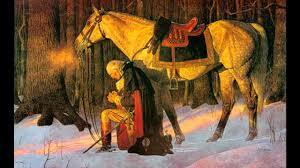 General George Washington kneeling in prayer. Members of the Congressional Prayer Caucus are continuing their efforts to promote unity across party lines; specifically in regard to the importance of protecting prayer and your religious liberty at the national level. House Resolution 547, (H.Res. 547), is affirming the vital role that prayer has played throughout America’s history, strengthening the fabric of our society, and recognizing May 1, 2014, as the 63rd annual National Day of Prayer. This bi-partisan effort has 6 original cosponsors: Forbes, McIntyre, Aderholt, A. Green, Lankford and Vargas. This act connects our 113th Congress with the national leaders that precede them. History affirms Congress has repeatedly asked the President to issue official prayer proclamations and encouraged citizens to pray, fast and give thanks to God for blessing our great nation. Affirming the vital role that prayer has played throughout the more than 200-year history of our Nation, strengthening the fabric of our society, and recognizing May 1, 2014, as the 63rd annual National Day of Prayer. Whereas the Nation has a long history of turning to prayer both in times of crisis and in times of thanksgiving, including over 130 national calls to prayer by the President of the United States since 1789″ … Read full text. God has long been America’s help and hope. Let’s join together in prayer and thanksgiving on May 1st. Find a National Day of Prayer event near you! Also, pray for the Members of the Congressional Prayer Caucus, their families and staff. Let them know how much we appreciate their efforts.